I was absolutely thrilled to receive this chevron number from Mindy Mae's Market. I'm off to Miami this week and the bold print plus easy wear of this dress will surely put it in heavy rotation while away. And can we discuss how amazing it is that the dress has pockets?! Highly recommend for your next vaca or for when the weather (fingers crossed) warms up! Love the pop of the colour the clutch adds! Love This! Super cute! and great for Miami! Cute dress! You look great! 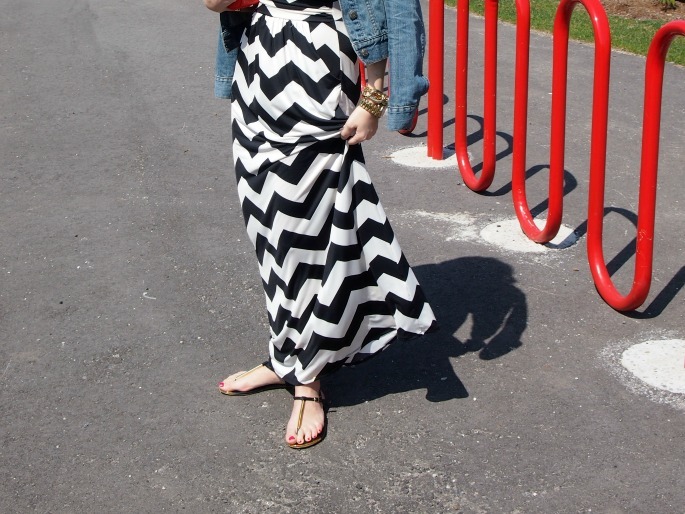 I have a short chevron dress on my blog today!! That maxi is perfect for Miami! Love this outfit like crazy! What a gorgeous maxi dress! I love chevron! Such a pretty dress! It's so flattering on you. Hope you have a wonderful time in Miami! Oh my gosh girl, I love this! Fantastic little number! I'm sure you've been told this many times before but your hair is incredible! How great is this dress?! The chevron print is so flattering and I love the chic black & white for Spring. You look fabulous! Love the chevron maxi! So cute! Love the big hair!!! And that dress, of course! That dress is so so fabulous! Perfect for the Spring and Summer! any dress with pockets is a keeper in my book! I'm loving all the volume in your hair! Foxy! I you style that red Rebecca Minkoff red bag so well every time! It's a great staple to add color to an outfit. I love that dress, the chevron print is so cute! love this dress and how you styled it, have a wonderful time in Miami! what a great dress on you. Recently found your blog and am in love! You have such a cute style and pair things together perfectly. Look forward to seeing more! Gorgeous! I love how this maxi does not look frumpy at all with the cinched waist. Love the bright bag and of course a denim jacket is always right! you look really lovely in this black and white dress with the zigzag patterns! Gorgeous! That maxi dress is super flattering! What an adorable maxi dress! And I love love love that chunky necklace - so pretty! This dress is so pretty! The denim jacket is perfect with it. I love the location too. FAB.U.LOUS! I love the bold print paired with the classic jean jacket! Have fun in Miami!